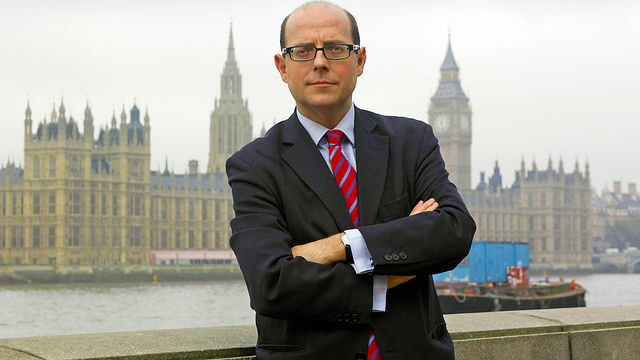 Nick Robinson, the BBC’s political editor. You might remember that Israel has been threatening Iran with an attack for years now. Polls indicate the British population (as well as Iranian, US and Israeli ones) show significant opposition to any such illegal act of aggression. At first sight, the official British response ought to be rather straightforward: condemn the threat, assist the UN in whatever efforts it undertakes to either prevent or stop the aggression, and ensure Israel is punished with sanctions and diplomatic ostracism if it does proceed with attacking its neighbour. This is interesting on two counts. First, not only is the UK government planning to take a course of action that goes against international law and public opinion, but it is effectively putting every UK resident at risk by making us all de-facto complicit in an act of international war criminality. If the Bolivian government had announced it would be offering diplomatic support and possibly military assistance to Argentina in the event of an attack by its neighbour on British positions in the Falklands, we would be expected to take for granted that any Bolivian officials, companies or even ordinary citizens, should be treated with suspicion and watched closely, possibly even deported or detained just in case. Yet this is precisely what the coalition government has nonchalantly inflicted on the UK population without mandate or consultation. Secondly, Robinson seems to find this rather unremarkable, boring even. There is nothing in his piece that suggests he is alarmed at, or even aware of, the serious implications of his own news item. Critical issues of legality get the most tangential of mentions, while public reservations about the attack, including by senior military, diplomatic and security personnel in the US, Israel and elsewhere, are presumably too irrelevant in Robinson’s eyes to merit inclusion. Of course, that a conservative-led coalition government is acting against the interest of its own population is hardly breaking news. That a public broadcasting institution such as the BBC is furthering and disseminating the official party line is to be expected. That Nick Robinson – him of ‘Nick vs Placard’ fame (see video above) – is reliably on message here is what Nick Robinson is reliably expected to be. But is political life in the UK so emaciated and numb that this fairly consequential news item has so far met with little more than indifference and some faint murmurings from the radical fringes? Does the Labour Party, for instance, have nothing to say about this? Did it not insist it had “learned” from its Iraq war fiasco? From the “Bradford Spring”? Will the Lib-Dem’s deathwish pursuit never end? An attack on Iran might or might not happen. As many have already pointed out, by ratcheting his thuggish blackmailing over a possible attack, Netenyahu has arguably achieved far more in terms of crippling Iran, through sanctions and destabilisation, than would have been possible with an actual attack. The fact remains: faced with months of jingoistic howling from the Israelis, the British political and media class, across the spectrum, has responded with either pathetic resignation or, more predictably, with some enthusiastic cheerleading of its own. As British soldiers continue to arrive from Afghanistan in coffins, almost on a daily basis, those who sent them to their demise are not done yet. Robinson, as well as anyone in politics or media who thinks war is the answer, should be made to listen to Patch’s haunting words over and over again, for weeks on end, until the message sticks. If that doesn’t drive some sense into them, then maybe giving them a rifle each and sending them over to the trenches will. See also: Editorial | The BBC: who cares if attacking Iran is illegal, look at these shiny F16s! As I’m sure you’ve noticed, my piece (published a couple of hours before the show you refer to) was explicitly concerned with what Nick said in the article itself. I happen to have watched today’s Daily Politics live and, alas, Robinson’s performance actually confirmed what I’ve written. Please be aware that when Robinson referred to “this issue”, he meant an actual Israel-Iran war, not the mere fact that the UK government is merrily drawing up plans to support the aggressor, which was, again, treated as a mere footnote. More pertinently, Robinson’s point was entirely framed within the context of what “this issue” would mean for coalition politics. He made little mention of the moral dimension (or lack of) of UK government support for an act of international aggression. Indeed, his only mention of “legality” in the programme, as in this morning’s article, was as some sort of technical hurdle the Lib Dems might struggle to overcome. In other words, hardly a Damascene conversion, quite the contrary. In any case, many thanks for your comment. This is like saying all Georges Ruggiu needed was to repeatedly watch the Magic Roundabout and he would’ve been fixed. Robinson should find another career but as this isn’t going to happen, people need to go elsewhere for their news. While I agree with many of the points made in this editorial I think it 1) makes a rather ridiculous statement in saying that Nick Robinson is simply disseminating the party line – I doubt the Coalition are too thrilled with the fact that this has made it onto the news agenda at all albeit low down; and 2) completely overlooks the fact that the idea that a British government would support an Israeli attack against Iran is NOT shocking news. It isn’t. One might be opposed to an attack but if it’s going to happen there’s no way it wouldn’t support Israel at the very least diplomatically. And that goes for Labour, the Tories and the Lib Dems. When Israel attacked Gaza in 2008/9 David Miliband sent out a press release at the time describing Israel as a continuing “beacon of democracy” in the Middle East. Just because Robinson publicly divulged what the coalition is thinking in private doesn’t change the fact he approves of it. At no point does he stop and say “Btw, UK support for an act of aggression is against international law and there is serious risk we would be involved in war crimes”. Instead, he moves on to what he thinks is the real story, the impact such support for a planned war crime on UK domestic coalition politics. The piece is ABOUT the fact that “this is not shocking news”. It should be shocking news and we ought to never stop pointing this out. To shrug and say “imperialist governments will be imperialist governments” is precisely the message an imperialist government wants to see and hear among the population. The job of much of the mainstream press is to make Britain’s partisan support for Israel implicit and normalised. These patterns will only be eroded with consistent attacks on journalists who have neither the will nor courage to challenge such assumptions.